24, P S Plaza, Nr. Mahanagar Bank, Yerawada, Pune - 411006, Maharastra, India. Satyam brings a bouquet of premium properties at prominent locations across Pune's skyline. 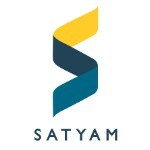 Backed by a rich tradition of quality construction, Satyam creates landmarks that stand out for their iconic design and superior workmanship.At Satyam, we just don't create stylish spaces; we build long-lasting relationships nurtured by trust, commitment and professionalism.